Marie Louise Elizabeth von Mendel was born as the illigetimate daughter of Duke Ludwig in Bayern and the actress Henriette Mendel. Her parents married morganatically in 1859. In 1869 the family was visited by her father's sister, the Empress Elisabeth, who liked her and invited her to Vienna and in 1876 to Gödöllo near Budapest. Marie Festetics, lady in waiting of the empress, wanted her away from her mistress and introduced her to count Georg Larisch-Moennich. Elisabeth encouraged Marie to marry him and the marriage took place on 20 Oct 1877. In later years Marie claimed that she had become addicted to Turkish cigarettes because she wanted to smoke herself to death during her honeymoon. They had two children, Franz Joseph (1878) and Marie Valerie (1879). From an affair with Heinrich Baltazzi two more children were born. 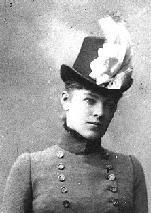 In 1888 she introduced Heinrich's niece Mary Vetsera to crown prince Rudolf. In 1889 Rudolf probably shot Mary and killed himself. Both were found dead at Mayerling. Marie was subsequently banned from the court. In 1894 she had another child by Ernst Otto-Kreckwitz and this time her husband decided to divorce her. In 1896 her marriage was over. In Rottach-Egern she met the opera singer Otto Brucks and they married in 1897. Because of his marriage to her he was no longer welcome on the Bavarian stages. In 1899 they had a son, Otto. She was short of money and decided to put her knowledge of the Habsburgs in writing. Emperor Franz Joseph bought her manuscript to prevent publication and gave her a pension. In 1906 her husband became the manager of the theatre in Metz. In 1907 her daughter by Heinrich Baltazzi died. In 1909 her son Georg learned that Baltazzi was his real father was and he shot himself. With the help of an English journalist she published "My Past" in 1913. In 1914 her husband died and in 1915 her daughter Marie Valerie died as well. During the First World War she worked as a nurse. In 1920 she played herself in a movie about her aunt Elisabeth. She lived in poverty for several years and decided to look for a new life in the USA. She promised to marry the person who would pay for the trip for her and her son and had an article with old pictures published. Thus she married the farmer and real estate broker William Henry Meyers in 1924. But he treated her badly and she left him in 1926. They were divorced and in 1929 she returned to Europe. She settled in Augsburg where she died in poverty in 1940. She was buried in the grave of her brother Ludwig at the Ostfriedhof in München. The grave of Ludwig in Bayern at the Ostfriedhof, Munich. Marie Larisch was also buried in this grave.